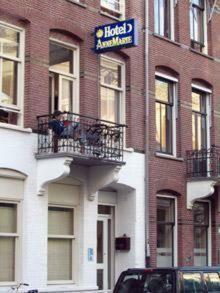 Hotel Annemarie, Amsterdam discount hotels and accommodation. Hostel AnneMarie is a combination of a hostel and a budget hotel in the centre of Amsterdam, close to two of the most visited places in the city the Van Gogh Museum and Anne Frank House. It is the perfect location in the centre of Amsterdam and is also near LeidsePlein with all the coffeeshops and discoÂ´s. There is a wealth of pubs and discos close to the hotel.We have rooms for 4, 5, and 6 people with a private shower, toilet, television and radio. 1,2 or 3 people rooms have a shared toilet shower and have in-room television. We have 6 and 8 person dorms with a toilet and shower inside. We offer Our Guests FREE Internet, FREE towels, FREE coffee and Thea.In the morning there is nice breakfast to get you started !There is no curfew, you have your own keys. Our staff are young, dynamic and friendly. We are looking forward to welcoming you and thank you for your interest in our hotel! View photos, room descriptions and make online reservations at Hotel Annemarie. Save on room prices at Hotel Annemarie, Amsterdam.